Tarot card readings have changed a lot over the centuries from the simple Italian card game that they started out as. Today’s tarot cards often hold images of angels, cats, dragons, dolphins, and astrological symbols; however, experts in tarot reading still consider the old-fashioned tarot card packs the most potent, and the most successful at giving an accurate reading. There are three basic types of tarot card readings, these are: the Marseilles, the Rider-Waite Deck, and the Thoth Deck. Below are the descriptions of each and a little about their history. This deck of tarot cards is one of the oldest and also the most famous decks in the history of the world. The cards in the deck are of wands, pentacles, cups, and swords. Though the deck is thought of as crude in some circles, and of course doesn’t have the prettiness of today’s “modern” tarot decks, it is said to be highly effective and has a mystical energy surrounding it and its history. It was in the 1800’s that Author Edward Waite, and eccentric scholar created his own tarot deck, which was released in 1909. He describes the cards as being symbolic instruments and said that they became their own type of alphabet. Because Waite was known to be an expert in mystical things, the Rider-Waite Deck became extremely popular and is still popular in many mythical circles today. From 1938 until 1943, the Thoth Tarot deck was under construction so to speak with renowned occultist Aleister Crowley. It took five years for the deck to be perfected and released to the general public. The meaning of the Thoth deck I so different from the Rider-Waite deck that people using it for the first time after using the Rider-Waite deck may be totally confused. Crowley’s concepts for his tarot cards was a mix of different sources such as Egyptian mythology and astrology to name a couple. Regardless of which tarot deck you use, it is important to know that they are said to be for entertainment purposes only. If you go online to get a tarot reading you should know that most sites say upfront that this is for entertainment purposes. While many people take the tarot readings very seriously and they have been known to be a huge part of astrology and other mystical religions, it is still considered by many to be just a parlor trick to be done at parties. 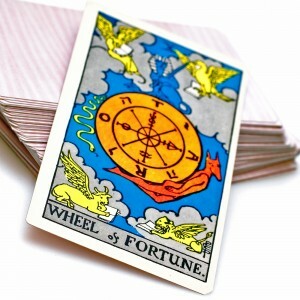 Tarot and tarot readings have been around for centuries and everyone has heard of them. Whether they are accurate and can truly read the future remains to be seen. Many swear by them and many others scoff at the very idea that a tarot card could tell them their fate and the fate of their loved ones. Whichever you believe, know that the tarot has been around longer than people today have been alive, so it must have grounds based in fact somewhere. Always remember one thing, astrology, can sometimes answers some questions about life, but no one can tell you the exact future of your life, its up to you.